Enrich your day-to-day experience with your home decor with this cleanly designed minimalist pair of white ceramic plant pot.Give this pot as a gift to yourself or to a friend for an event to brighten up any home with charming modern ceramic design. A modern round flower pot with Metal Stand.Minimalist look that fits many styles. 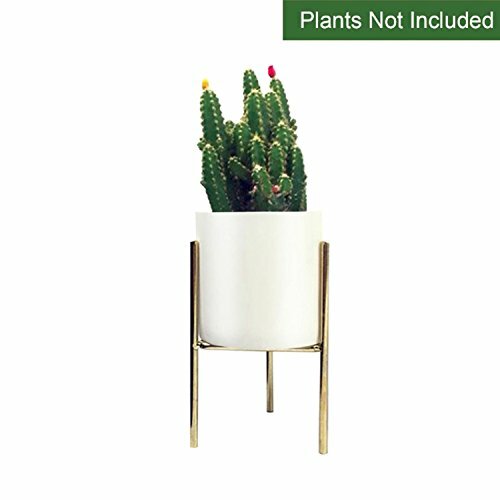 Beautiful white ceramic planter for indoor plants such as succulent, cacti and air plants. Perfect for the nursery,office, kitchen or the bedroom! Made of durable and high quality white ceramics and brass plated iron, characteristics of the corrosion resistance and durable. NOTE: Plants not included.Approximate Dimensions (in inches): 3H * 3.1 Diameter inch(Flower Pots)/ 4.7H*3.1 Diameter inch(Metal Stand). 90 DAYS WARRANTY & REFUND IF NOT SATISFIED, SAFE BOX PACKING. If you have any questions about this product by CUUCOR, contact us by completing and submitting the form below. If you are looking for a specif part number, please include it with your message.